Ms Mandy Shackleton, a qualified dive master, who watched 500 divers of several nationalities, including Britons, off the coast of Kenya has come out with the following facts after a two-year study of scuba divers. She is also a marine scientist at Hull University’s marine sciences centre. Women have better orientation, underwater.They have a greater awareness of what is going on around them. Women divers are much more aware of their surroundings than men. Women were found to be calmer, less aggressive and more safety conscious than their “gung-ho, sensation-seeking” male counterparts. Men took risks and were prone to showing off. The men experienced “a chain reaction of hormones” that caused them to lose their “buoyancy control” more easily than women. The stress hormone cortisol is released first, followed by testosterone – the hormone linked with aggression – and finally, adrenaline.The combination of these three results in erratic, dangerous diving. On an ecological level, men’s “spatially unaware” behaviour is damaging the world’s coral reefs. There is growing concern about the future of the reefs, which are vital habitats for thousands of fish species.Many male divers swim too close and break pieces off with their flippers or “fins”. Their flippers also churn up the seabed sediment, which “suffocates” and kills the living coral. More women prefer diving and they now make up about 40 per cent of all scuba divers. They do tend to have a more careful approach than men. 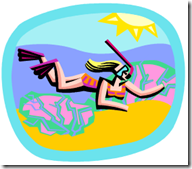 OldSailor congratulates women divers for their superior performance underwater.